Burley Bike Trailer: What Makes Burley Trailers Different? One of the most popular bike trailers around, Burley Bike trailers set the standard in quality and convenience. From their iconic Burley Bee bike trailer to their pet wagons and flatbeds, Burley bike trailers are made for any occasion. Best of all, the trailers are made of quality materials that offer long lasting and sturdy builds that you can feel comfortable attaching to the back of your bike. The most popular Burley trailer, the Burley Bee is a bright yellow trailer for kids that allow families a chance to adventure together. The trailer fits two children comfortably and comes with safe and secure seat belts that provide you with peace of mind as your cycle. Some key features for the bee include its ability to flatten to provide convenient storage options. Also featured is a storage compartment that is perfect for bringing your children’s toys along for adventures. The bee offers tinted side and rear windows to keep your kids cool and safe from the sun. Also included with this Burley trailer is a hitch and tow arm, which make it bike ready. All you have to do is mount it to your bicycle and before you know it you’ll be off to the races. The trailer also comes with a flex connector that means the bike can lay flat and the trailer will remain upright, allowing for convenient loading and unloading. Quality Safety Features: Standard in every Burley trailer is a full aluminum roll cage, wheel guards, reflectors for improved visibility, and UV protection in the trailer itself to help protect against the sun. You can also have peace of mind because all Burley children trailers receive third party testing to ensure that they are safe to transport your children. Durable Design: By using high quality materials including aluminum and steel, Burley trailers are built to last. They are treated to avoid water damage and rusting, as well as to keep internal components like wheels and spokes in good condition. Extensive Testing: When you attach a Burley Bee bike trailer to your bike, you can rest easy knowing the amount of testing that goes into all trailers manufactured by Burley. As an example, Burley simulates over 500,000 cycles in their push and pull test to ensure the trailer is compatible with any and every bike on the market. These tests also include drop tests, crush tests, and drum tests, which simulate going over a bump 25,000 times. Versatile Use: Burley trailers are built to accommodate any situation. With storage for toys, adjustable seats for napping, and optional features like stroller conversions, it’s no wonder so many people trust in Burley. There are few scenarios you would find yourself in that Burley has not already thought through and tested. That is why they make a great addition for any family looking to take adventures with their little ones. When it comes time to purchase your Burley trailer, there are many things to consider. First, you should know what features you would like with your trailer. This can vary from things like colors, to construction, to where you plan on using the trailer. A Burley Honey Bee for example offers an additional wheel on the hitch that allows users to easily convert their trailer from a bike attachment to a bike stroller. Burley trailers also come at various price points that all come with their own features. From heavier duty suspension, to single rider bike strollers, a Burley trailer is the perfect way to take your kids on their own adventures. Additionally, Burley offers solutions for your fur babies as well. 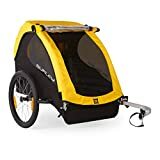 If you would like to take your pet on an adventure of its own, look to the tail wagon as your bike stroller solution. These trailers are built to the same standard and come with aluminum roll cages as well. Take to the parks or the trails when you purchase a Burley Bike trailer. A bike trailer is the perfect opportunity to take your little ones to the park without having to worry about rear mounted child seats that are not as safe as a trailer. 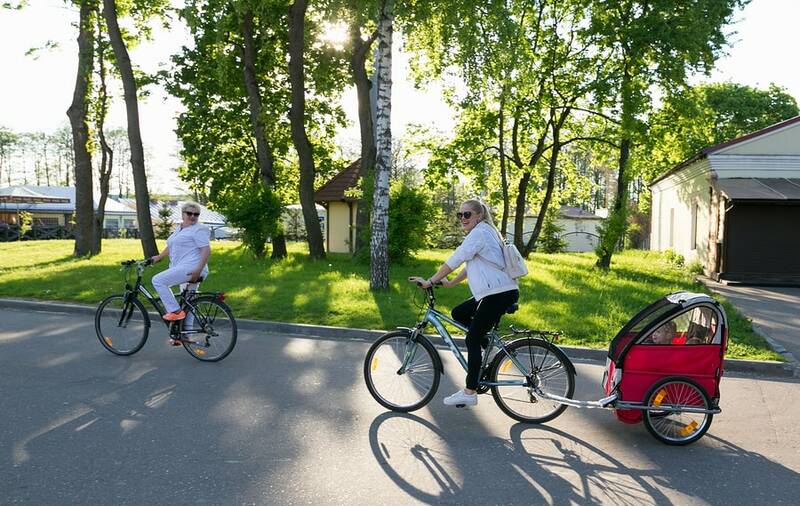 A bike trailer creates a fun and adventurous environment that is perfect for kids, and also creates plenty of benefits like having a shady place to eat and nap. With a range of price points and plenty of added features, investing in a Burley trailer is a must.